Have you ever spent time researching online, going from site to site trying to find the kind of help you need? Sure, me too, everybody does. That makes you a good candidate to review my new book. 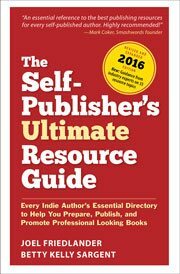 And I think it’s one of the reasons The Self-Publisher’s Ultimate Resource Guide has been so popular. It really helps. The book, coauthored with traditional publishing pro Betty Kelly Sargent, was #1 in its category on Amazon.com on publication day, and has stayed there ever since, almost a month later. That tells me people are finding real value. The over 850 curated, verified, and up-to-date listings to service providers of all kinds are saving people time and making resources easier to find. When you have something that’s helping authors so much, you naturally want to share it with as many people as you can. We’ve set aside a limited number of free review copies and I want to give them all away. I’ve often counseled authors that one of the best ways to build the buzz around their book is by giving away copies to people who will help promote the book. So if you’d like to review the Resource Guide, I’d like to give you one of those free copies before they run out. This offer will expire at midnight Pacific on Friday, January 16, 2015. I just filled in the form but wanted to let you know that I will be reviewing it on both my websites the one I gave that has 18,000 subscribers and my regular book review site. Plus Amazon, etc.. Thanks, Teddy, I really appreciate it.